Students at Glen Ames Senior Public School in the Beach protest provincial government changes to education on Friday, March 22, morning. Photo by Alan Shackleton. Students at Glen Ames Senior Public School walked out of class Friday morning to protest provincial government changes to education which will result in larger class sizes and fewer teachers. 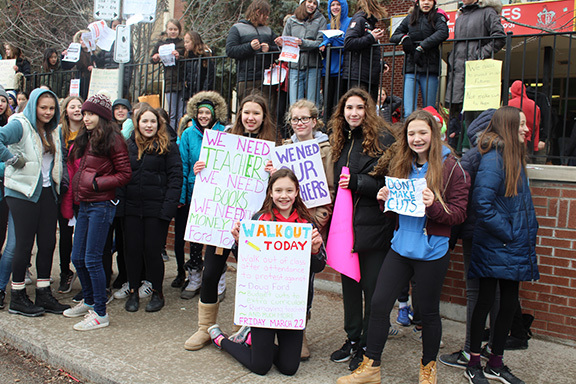 The March 22 protest saw the school’s Grade 7 and 8 students gather on the sidewalk on Williamson Road in front of Glen Ames. The students chanted and held signs expressing their displeasure about the changes being made to public education by Premier Doug Ford’s Progressive Conservative government. “We’re protesting against Doug Ford and the cuts that will affect all of us,” said Grade 8 student Rachel McColl. The students are concerned that larger class sizes will lessen the quality of their education as teachers will not be able to spend as much time helping individual students. The Glen Ames protesters were also worried about the impact of larger classes and fewer teachers on extra-curricular activities available for students. They are worried about this both for future elementary school students, but also for themselves as they head into high school next year, said Grade 8 student Chloe Barrass. “A lot of high school is about the sports teams and arts clubs, and we’re worried that we aren’t going to be able to have the high school experience we want to have,” she said. The protest began shortly after morning classes began and was expected to last until the lunch hour. Many passersby, especially drivers, honked their horns in support of the students which drew cheers.